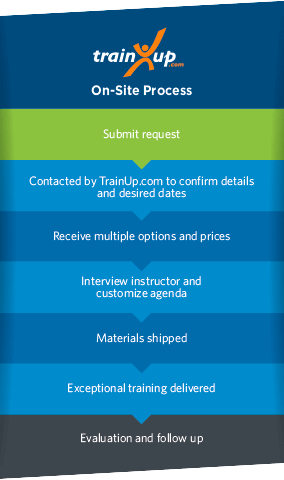 TrainUp.com specializes in organizing on-site / in-house SQL Server training services. We've worked with hundreds of companies to bring the best SQL Server instructors and customized course content directly to their facility. We simplify with a Three-Step Process. We’ll get in touch to learn a bit more about your needs. You’ll also have the opportunity to customize your agenda. Your time. Your place. Your topic. Location: We bring the best trainers to your location to train your employees onsite. Privacy: Having training at your own facility keeps your inhouse training needs more distant from public attention. Tailored Program Content: This isn’t cookie-cutter, one size fits all training; this is a customized training solution based on your needs and challenges. Boosts Employee Productivity & Profits: Train your staff how to make the most of their time and abilities right where they come to work every day. Your Schedule: You choose the date, and you choose the times. Need training on a Saturday? We can do that! Keeps Employees Up to Date on Current Company Protocols – Need compliance training? New ownership or management with some new roles added? Onsite Training is the perfect option for all of your team training!